The value proposition sits at the pivot point of the entire business model. Mapping the business model of a new product or service is one of the most important parts of building a business strategy. Strategy frameworks have traditionally been the domain of MBAs but they are so important that these days the tools have been democratised for use by entrepreneurs, designers and technical teams. The Business Model Canvas is a toolkit from 2009 that drew on Michael Porter’s value chain maps and Peter Drucker’s theories of the firm (among other sources). The Business Model Canvas is a chart that maps the key things that a business needs to get right to be successful. The Business Model Canvas condenses the main elements of a business strategy into a single page. 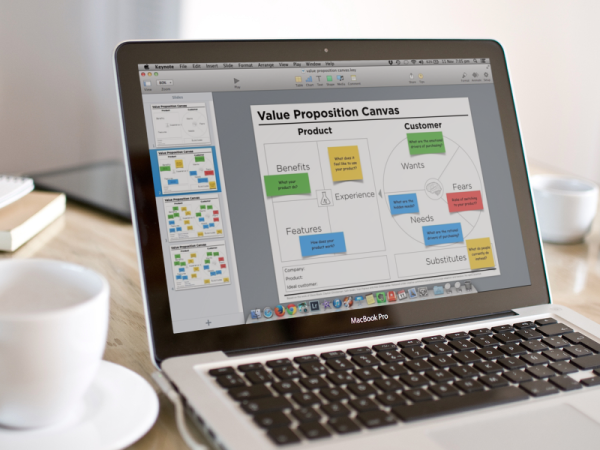 The Business Model Canvas has become the preferred tool for modern startups to use when rapidly testing a business idea. It’s attractive because it condenses years of business school and management consulting practise into a single page (with some straight-fowards questions for each section). – This is either a good or a bad thing depending on how much you love management jargon. Any strategy tool is only as good as the facilitator or team who are using it. Each tool carries hidden biases and assumptions. So choosing a good tool is important. Strategy tools are great ways of providing structure to a conversation and allowing people outside of the pure strategy professions to think about whether they are doing the right things at the right time, in the right order. Strategy frameworks are only as good as the facilitator and team that are using them. Having used it in several client workshops, my issue with the Business Model Canvas used to be that it didn’t do enough to encourage empathy with customers and to force the startup to be accountable for how they communicated with their audience. In short, it didn’t place enough emphasis on the company’s value proposition. 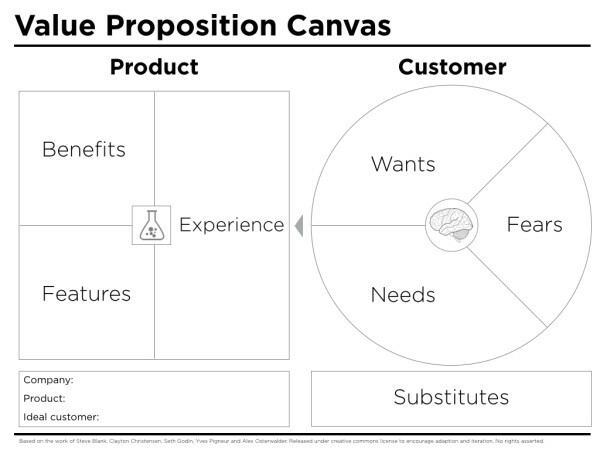 A “value proposition canvas” is a chart that maps the key things that make up your product and why people buy it. 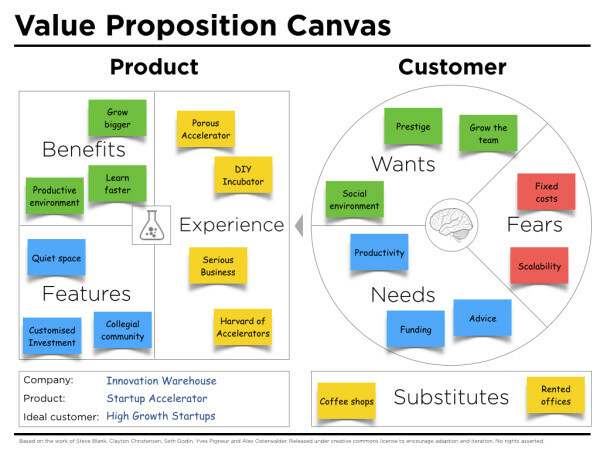 There are many different value proposition canvases. Some are proprietary, some are open source and some are creative commons. Any canvas that helps you understand your customer, your offer and how the two fit together will help you clarify your value proposition. 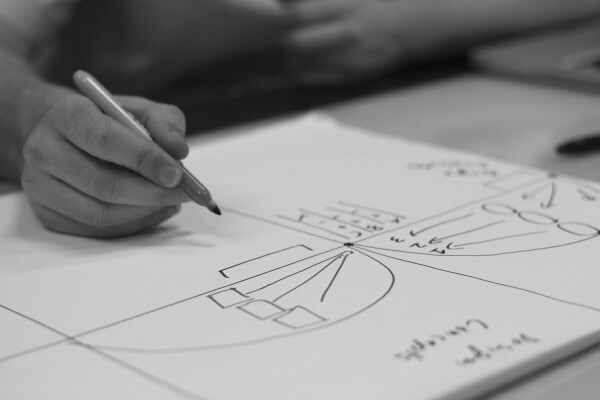 In 2012, Alex Osterwalder and his team released their Value Proposition Designer. Their version of the value proposition canvas is copyright and can only be used with credit to www.businessmodelgeneration.com. The Value Proposition Designer includes several bits of thinking from the Lean Startup movement such as “jobs to be done” and “customer pain”. It’s good, but it’s not perfect. I (like many brand strategists and advertising planners) often find myself standing in a supermarket transfixed, watching other people shop. I could literally stand for hours observing the range of human experience and emotions that go into making even the most banal decisions. So many different parts of a person’s brain are engaged when they make even the smallest buying decision. If you’ve ever eaten a donut while on a diet then you know that not all human decision making is rational. – But even if purchasing behaviour is irrational, it’s still predictable. That’s why I’ve drawn from behavioural economics and choice psychology to rebuild the value proposition canvas. Modelling human behaviour and decision making is a rich an diverse field of study. You can read more about how people make decisions in books such as Nudge, Predictably Irrational and Influence. Personally, I’ve drawn my models from the field of cognitive psychology and behavioural economics. I’ve created a canvas to guide startups into examining the human experience of their customers. This canvas contains questions and sections that manoeuvre users of the canvas into thinking through the customer experience. Each section of the improved canvas includes questions to ask when filling in the chart. Features – A feature is a factual description of how your product works. The features are the functioning attributes of your product. The features also provide the ‘reasons to believe’. Many FMCG marketers deride the importance of features because features are no longer a point of difference in most FMCG marketing. But for technology products and innovative new services the features can still be important. Benefits – A benefit is what your product does for the customer. The benefits are the ways that the features make your customer’s life easier by increasing pleasure or decreasing pain. The benefits of your product are the core of your value proposition. The best way to list out the benefits of your product is to imagine all the ways that your product makes your customer’s life better. Experience – The product experience is the way that owning your product makes the customer feel. It’s the sum total of the combined features and benefits. Product epxierence is different to features and benefits because it’s more about the emotional reasons why people buy your product. The product experience is the kernel that will help identify the market positioning and brand essence that is usually built out of the value proposition. Wants – The emotional drivers of decision making are things that we want to be, do or have. Our wants are usually conscious (but aspirational) thoughts about how we’d like to improve our lives. They sometimes seem like daydreams but they can be powerful motivators of action. The wants speak more to the pull of our hearts and our emotions. I may need a car to get from A to B, but I want a BMW. 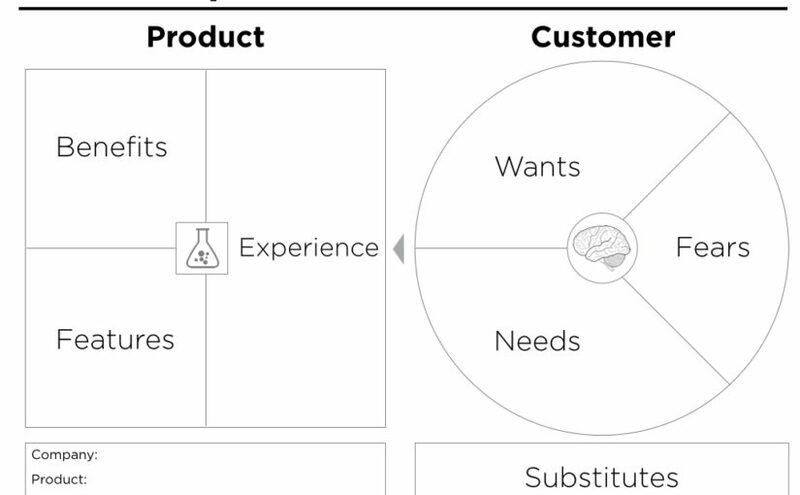 Needs – The customer’s needs are the rational things that the customer needs to get done. Interestingly, needs are not always conscious. Customers can have needs that they may not know about yet. Designers call these “latent needs“. The best example is that none of us knew that we needed a portable music player until we saw an iPod for the first time (we also then suddenly wanted an iPod rather than any other perfectly good music player). The needs speak more to the pull of our heads and rational motivations. Fears – The dark side of making a decision is that it carries fear. Fear of making a mistake, fear of missing out, fear of loss and dozens of other related fears. Fears can be a strong driver of purchasing behaviour and can be the hidden source of wants and needs. Customer fears are often the secret reason that no one is buying your widget. For any product there is a secret “pain of switching“. Even if your product is better than the competition, it might not be a big enough improvement to overcome the inertia of the status quo. Substitutes – These aren’t the obvious competitors, instead look for the existing coping behaviours. This is on the canvas because it shocks us into remembering that our customers are real people with daily lives who have made it this far in life without our product. No matter how much better your product is than the competition, if it isn’t better than the existing solutions then you don’t have a real world value proposition. A key finding from the process of mapping a value proposition is often “we don’t have enough information to answer this section”. That is a perfect moment to adopt a lean startup approach and to get out of the building to ask existing customers and potential customers about their wants, needs and fears. Mapping a company’s value proposition is a great shared exercise for a cross-functional management team. It gets people from outside the marketing team to contribute to marketing insights without having to admit that what they are doing is “marketing” (because marketing can be a loaded term for some professions). The Innovation Warehouse is an angel investing syndicate with a co-working space for the member investors and their portfolio of startups. Building a value proposition canvas identified that a key need for a startup is a quiet and productive space. The Innovation Warehouse value proposition was adjusted to highlight productivity. The productive environment was already a feature of the existing space but wasn’t being promoted in the marketing materials. It was a simple matter to add the feature into the collateral to address the customer need. Evernote’s value proposition is translated directly into their marketing materials. Their landing pages lead with copywriting that includes features, benefits and the experience on offer. Their product and customer are carefully matched. Evernote’s value proposition is anchored on simplicity and speed. The features, benefits and experience of the product are carefully matched with the wants, needs and fears of their target audience. 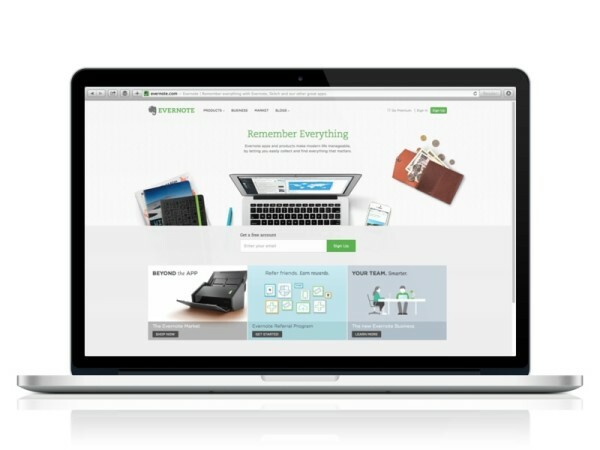 Evernote uses multiple landing pages to account for different products and different audiences. Evernote covers all the elements of their value proposition in a single landing page. Evernote could improve their copy by addressing a few more of the common fears such as data loss, backups and data portability. Get people from different teams working together. Test assumptions about customers and marketing priorities. Rapidly define copywriting and brand messages for campaigns. The value proposition isn’t a substitute for brand strategy and copywriting but if used well it will translate very quickly into usable and persuasive messaging. The value proposition canvas is not a full brand strategy and doesn’t include the long-term story telling elements that you would need to create a well rounded brand over time. 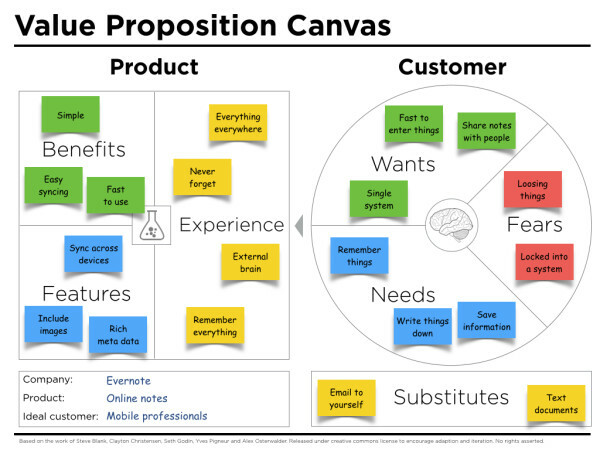 Even so, the value proposition canvas is a useful tool to use to establish product-market fit in a hurry. The PDF and Keynote files are available for download so you can edit them and create your own canvas. I’ve made the PDF (Value Proposition Canvas.pdf) and editable Apple Keynote Presentation (Value Proposition Canvas.key) files available for you to download so that people can print out the canvas, edit it and create their own versions. No need to attribute it to me, just say thanks on Twitter at @peterjthomson if you find it helpful and check out my book on Digital Marketing for more in-depth strategy techniques. The tool can be used to map your existing value proposition, your competitors and the proposition for any new products and services that you are considering building. Hi Nick, good call. I’ve updated the article with links to a PDF and Apple Keynote Presentation that you can download and edit. Peter, great article and thanks for taking the time to improve the VP canvas and offer the files for download. This is a great article. Everything makes sense now. 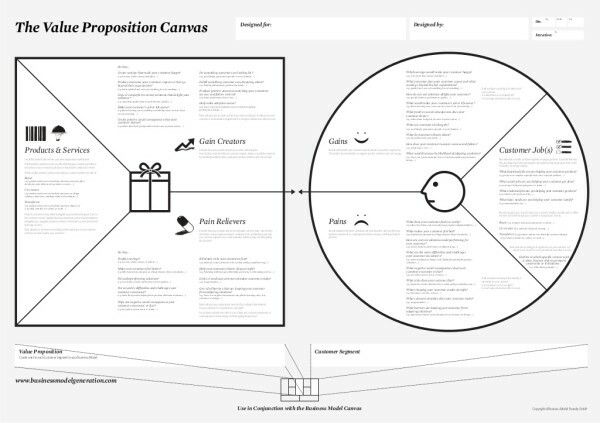 I spent months and months on the other value proposition canvas model. This is very simple and makes sense. Great article Peter, much easier for people like myself and probably stakeholders to understand than the older canvas. Seemed like as much time was spent explaining the canvas as using it! I was just curious as to why it goes left to right? As it’s usually used in creative workshops you can really start anywhere. The reason that I suggest starting with product features (even when mapping a new startup) is to get them out of your head and move quickly on to the things that matter (the user). What if the customer isn’t an individual person but a company who you are targeting? Should you look at the wants/needs/fears from a company perspective (ie want to grow in certain markets, Need more agile product development …), or from the decision making stakeholders inside the company? (ie his/her wants/needs/fears) in order to achieve/reach his/her goals within the company? Excellent question! The subject of how to market to companies is something of a passion for me so I/m very conscious of the issue that you raise. The answer is in the way that the tool is used. 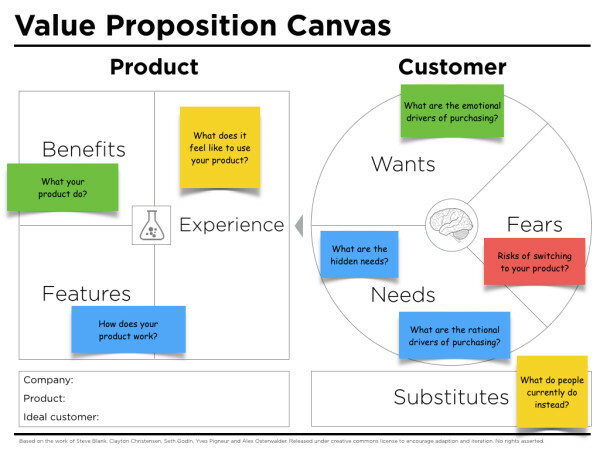 The value proposition canvas is a model for matching a product to a customer who can buy the product. The key outcome is to look for things in the product that no one wants (and kill them) or for things that people want but aren’t in the product (and create them). In my experience, the best way to use the canvas is to put the aggregate of the various individual wants/needs/fears of all the key people inside the company on the canvas (colour coded for different internal divisions). For example, HR (blue post-its) want the new training software to be effective but are afraid of it breaking. The shop-floor staff (green post-its) want the software to be easy to use but need to understand the complex content to do their jobs. The finance department (red post-its) want the software to be cheap but need it to be payable monthly not in a single transaction. Etc, etc. One thing to keep in mind is that a “company” doesn’t exist. It’s a useful legal fiction that we all agree to respect, but in the end purchasing decisions are made by human beings with competing motivations. I know it seems hard to map out all these various wants/needs/fears from multiple people but that’s why B2B companies are more interesting (and often more profitable). I’ll give it a try using with your suggestion . I liked the clarity of your model. 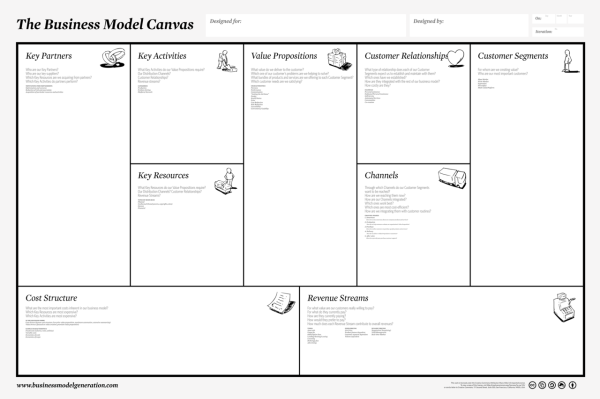 Great article and for sure enriching the discussion on the use of the Business Model Canvas. Appreciate you offering the presentation templates as a free download. Great article, Peter! I like your version of Value Proposition Canvas more than Osterwalder’s. Hope you will find it useful, Alexey. This model is really brilliant – a radical improvement over Osterwalder’s Value Proposition Designer. I find thinking about the customer and the product from the perspective of the emotional buying decision process extremely helpful for calling out the most important parts of the overall proposition. Often, the real differentiation of a product isn’t what it does (the gain creators/pain relievers), but HOW it does it – ie, the experience of using the product. Calling this out as a discreet item helps the thought process tremendously as you’re forced to articulate how the overall user experience relates to the value proposition. I think with Osterwalder’s Value Proposition Designer it is easy to fall into the trap of listing features, but not thinking about the overall experience. Thank you so much for addressing some of the gaps I’ve found in the previous attempts at a value proposition canvas. Yes, we liked it so much we had to put it up for others to discover! We used the business canvas to be able to clearly communicate our start-up idea and that worked really well for us. We are now looking at other product lines and it looks like the value proposition canvas is going to work really nicely for that too. It seems a very interesting instrument for working with comunication plan of a product; Thanks! BMG VPC: Allows me to design better working elements of the product or service based on the underlying reason why someone would be interested in the product to begin with. I like the ‘customer jobs’ as this aligns to my orthodox business analyst side of my brain. YOUR VPC: I see this as great to better profile a customer and identify fit or gaps. Thus its a better form of client empathy mapping. My business design side of the other part of my noggin finds this useful. ALEXEY VPC: I see this as a great way of confirming the product/ service, the profile match and formulate the bones of a pitch. My trying to win over executives experience finds this an important tool in answering their questions before they ask it! Either way, great stuff – thanks for the contribution. Muchly appreciated. Congratulations, Peter! I think it is an excellent tool that you have made. I am getting some practice to get familiar with the canvas and made one for Salesforce Sales Cloud product (at BlankCanvas). From the Salesforce website, I haven’t been able to identify the customer needs and fears but I was quite impressed to see one of my guesses for their “customer wants” as the tagline for their product. Thank you for sharing this usefull information. I am wondering whether you have thought about applying this method for career planning? or maybe there is an example but I couldn’t found anything so far. It would be nice if you could give some suggestions about this issue. Peter, I agree that Osterwalder’s value proposition canvas is rather “technical” while your version better addresses the psychology behind buying. I find your explanations concise and helpful. The only thing that I don’t quite understand is the focus of the “Fears” section. Would you see here only the “Risks of switching to your product” or also fears the customer has related to the problem being addressed (e.g. the customer wants this because he fears that)? The intention with the fears section is to force us to understand the deeper human motivations and context that our customers exist in. The fears could be a motivating purchasing factor (such as “I’m afraid of being sick so I’ll upgrade my health insurance.”) or they could be blocking factors (such as “I’m afraid of making a bad decision, so I’ll do nothing.”) They key is to spend some time hanging out in the scary stuff that we usually ignore about our customers and their lives. What great work and a useful tool that can help startups discover their value faster. But can we use it to differentiate our value from other companies? Because I think that after we found the value that we want to build, we have to at least look for another companies that have the same value proposition and then try to have something fresh and new at the market. The CVP is much better when the customer is on the left – we read left to right and this makes us focus on the customer first than how we can design a service or product for them. With the service or product on the left we think about us (the producer) first – no so customer focused. I agree with your comments on the marketing aspects of the CVP. I like my students to quantify the pains and gains in $ values where possible (not always possible!). Great system and I have used it both in lecturing and professionally. My interpretation of needs is very different. They are not rational by definition., Think about Maslow’s hierarchy of needs. A need for belonging is not a rational need (something is rational when we reason our way through it). needs are not reasoned, they are innate to our psychology. Thanks Peter for this new approach of the Value Proposition Canvas. I love the fact that you take into account the User experience (If I dare, I might propose to add Peter Morville’s work on UX…) and the split between the rational and emotional aspects of customer engagement. I really like the framework. One question: how is your “Needs” different from “Jobs to be done”?